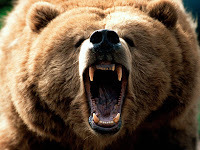 "How to Survive a Grizzly Bear Attack"
Also, "15 Tips for Surviving a Bear Encounter"
I figure I'm headed back up to Buffalo this weekend, so it can't hurt to study up on crazy wildlife attacks. Am I right? Who the hell votes in early elections? Is your relationship bad for the planet? "An Adman from A to V"